My boyfriend (now fianc�) surprised me with a romantic weekend at the Brampton. When we returned to the inn after dinner, we "found" a bouquet of roses, a bottle of champagne and two champagne glasses on the table of the front porch. That is when my boyfriend proposed!! He had been planning it all along with Danielle's help. The room, the breakfasts and the landscape were amazing. It was so romantic and I will never forget this incredible day. This Inn far exceeded my expectations! Simply put, it is magnificent - beautiful beyond belief! The grounds are immaculate and our stay in late October provided an even more splendid scenery with the fall-colored leaves. Danielle greeted us with a warm welcome and chocolate cake! :) She walked us to our room (Sunset in Garden Cottage) which was even more beautiful in person... the fire-place was already prepared and the decor of the room was warm, inviting and romantic. The parlor in the big house was open 24/7 and fully stocked with yummy treats and beverages/wine/sherry (all complimentary). Our breakfast was served in bed every morning of our stay and was delicious! 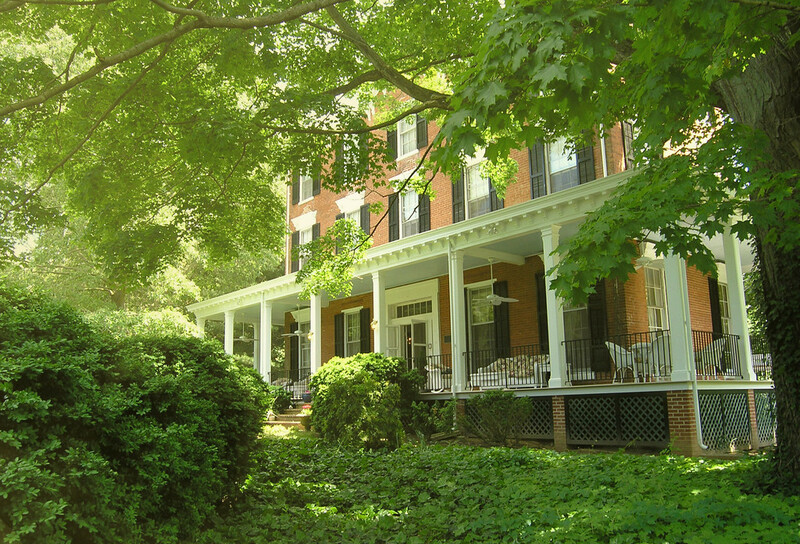 The ambiance and peaceful tranquility of the Brampton Inn (nestled right in beautifully quaint Chestertown) is what makes this place so special. I would highly recommend this inn to any couple looking for a peaceful, relaxing, and intimate getaway. Our stay at the Brampton was nothing short of magical. This Bed and Breakfast caters to privacy, indulgence and relaxation like few other places I have stayed. Our rooms' amenities were tastefully selected and ultra functional. A few of my favorites include the heated towel bar, the body jet/steam shower, and discrete flat screen tv's to watch the Inn's extensive DVD collection on. A la carte breakfast was delicious, and perfect for my picky eating habits. Sitting in the whirl pool with a wood burning fireplace crackling in the background, sipping champagne and snacking on homemade (complimentary) cookies is definitely one of my life's top ten most enjoyable experiences. We recently stayed at this inn for two nights on a holiday weekend. We had the Sophie Suite. The experience was delightful. The room was large with a nice sized bathroom which had a shower and a jetted tub for one person. The air-conditioning was very quiet, the bed was comfortable, and the sheets were very soft. The suite had a sitting room with 2 chairs and a TV. There were windows all along the side of this room, so it was very nice. My only complaint was that the TV was very small and placed in the sitting room at an awkward location. It was difficult to sit in one of the chairs and watch TV. I would have preferred for TV to be in the room with the bed. Another option would be to put a second larger TV in the bed room. This inn has a very large wrap around porch with tables, chairs, and two swings. It was delightful to sit on this porch any time of the day. We chose to each breakfast outside each morning. Breakfast varies daily, but includes fruit, juice, coffee or tea, and an egg type dish or something like pancakes or waffles. You can also get oatmeal or eggs any style. Excellent breakfast! Another nice touch they have is that from 4 to 5 each day, they serve lemonade and ice tea along with a sweet treat and another type of treat such as quiche. A glass of sherry is also available beginning at 5 pm. Coffee and tea are available 24 hours. This site is a short drive from Chestertown and the waterfront. We found nice restaurants in Chestertown and in Rock Hall which is about 12 miles away. The family that owns the inn was very nice and accommodating. I would definitely go back. New York Times, New York Daily News, Philadelphia Inquirer, Washington Post, Baltimore Sun, Los Angeles Times, Washingtonian, Southern Living, Philadelphia Magazine, Chesapeake Life.